Is gardening a stress buster? Could be. 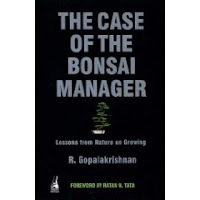 But this book - The Case of the Bonsai Manager, penned by R Gopalakrishnan, executive director, Tata Sons has nothing to do with bonsai cultivation by managers. Yes, I know, some of my fellow managers (past colleagues and current colleagues) have real (?) 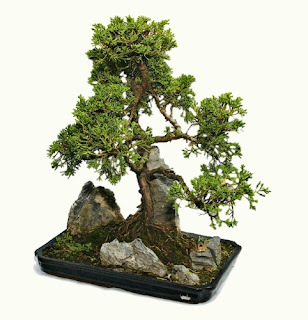 bonsai plants sitting pretty on their desks. Some of these fellow managers even talk kindly to them. After all this is what we learnt in biology class - talking to plants helps them to thrive. Yes, we were taught this and much more. Later we had to absorb stuff about logical thinking and analytical techniques. Is this enough to make you or me a good manager? R Gopalakrishnan, who addressed TiE members (and non-members), recently in Bangalore thinks this ain't enough. Intuition is also necessary according to him and this is not taught in any school. A manager can develop to his full potential by learning to be intuitive, inclusive and humane. We have knowledge and knowledge is knowing what we know. While intuition is not knowing what you know. When knowledge is integrated with intuition it becomes wisdom. Gopalakrishnan also admits that intuitive managers tend to be emotional creatures and may be passed over at the time of promotions. After all, the business world still wants leaders who are logical and calculative. However, "Just be yourself", were the wise words I walked away with. Intuition can help save your business from doom or indeed that of your employer. So rely on your gut feel, be more open to your inner voice and indeed the voices around you - be they of your customers or team players. Hopefully, several of the "bosses" present at the TiE even also walked away with gems of wisdom and may not frown on intuition going forward. Here is to a more intuitive workplace!